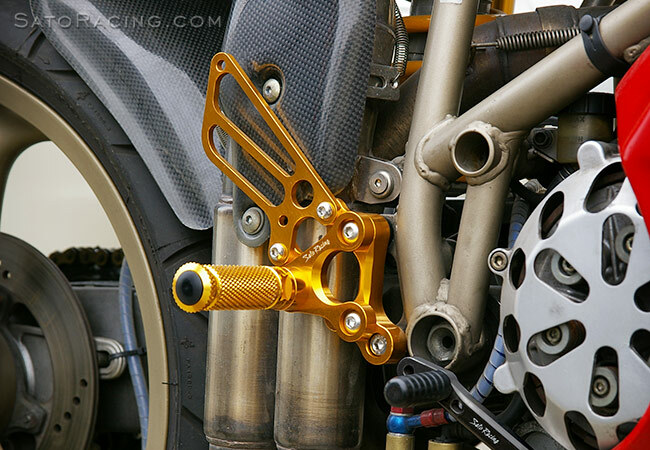 SATO RACING Rear Sets for Ducati 748 / 916 / 996 / 998 are CNC-machined from high grade billet aluminum and anodized in your choice of Black, Silver, or Gold finish, with stainless steel bolts. Modular step plate design provides 4 adjustable positions, in a range that places your feet higher and more forward compared to stock, so you can find the ideal position for your riding style. These Rear Sets can be used with the stock brake pedal. 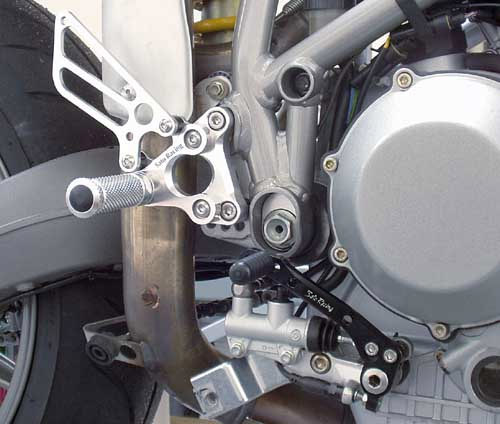 We do offer an optional Brake Pedal Kit that goes well with these Rear Sets, providing additional adjustment options. 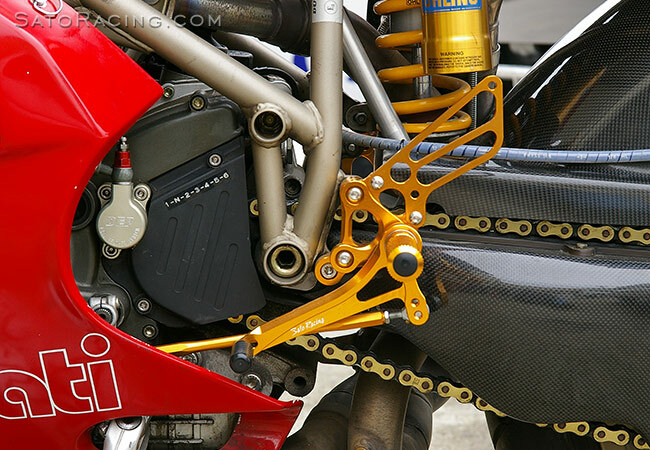 note: all measurements are in relation to STD (stock) foot peg position. 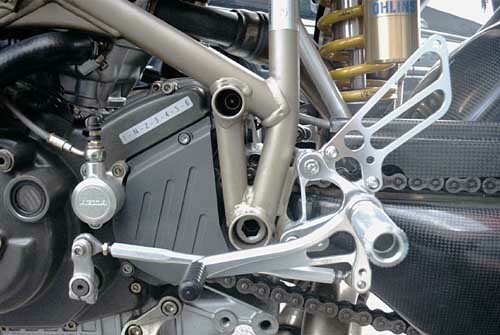 Note: the following photos show an earlier design version of these Rear Sets, pictured installed on a 916. Our latest version of these Rear Sets features an updated shift pedal design with additional adjustment holes, along with a few other design improvements. The shift pedal utilizes double stainless bearings for smooth, precise movement with a solid feel. feel. The Step Plate can be repositioned on the Base Plate 4 ways. by flipping the stock change arm the opposite direction. 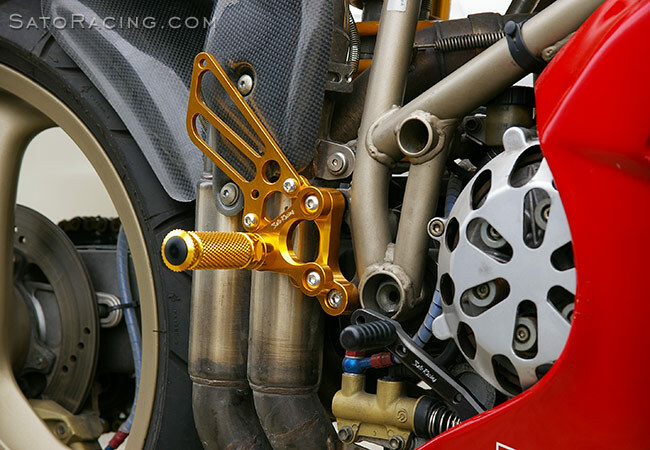 * Click Here for important info about Sato GOLD-anodized parts. 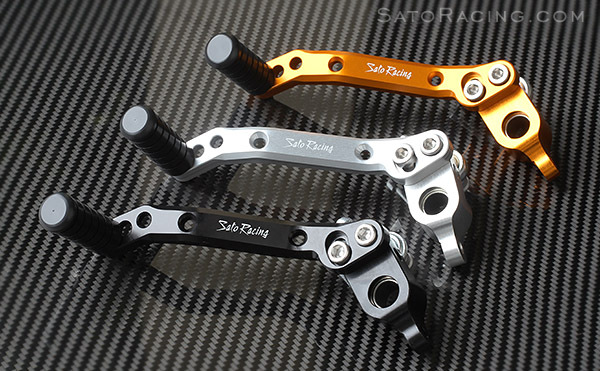 SATO RACING Brake Pedal Kit replaces the stock brake pedal on Ducati 748-999, and works well with Sato Rear Sets part# D-999RS and D-916RS. Made of high strength billet aluminum, with stainless steel bolts. Position of the pedal is adjustable. Includes Delrin pedal tip. Choice of Black, Silver or Gold anodized finish. SATO RACING offers a full selection of Replacement Parts for our Rear Sets. Some additional parts such as Shift Rod, Rod Ends and related hardware can be found HERE.